Made exclusively for the savvy supplement shopper, our Raspberry Ketones are maximally dosed at 250mg per capsule, and at 2 capsules per day, one bottle will last a full 60 days. We guarantee the potency and purity of all our products, and Raspberry Ketones is no exception. 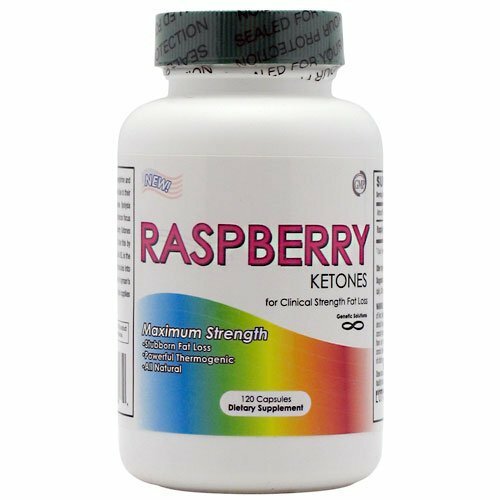 Our Raspberry Ketones is one of the few products that effectively delivers the dosages that are used in the relevant clinical studies. The benefits of Raspberry Ketones are both profound and unique. A special enzyme that is needed to break down fat within a cell, before it can be used for energy, is often depleted. Raspberry Ketones increase the enzyme, known as Hormone Sensitive Lipase. Other hormones, such as adrenalin will cause the same effect, but with Raspberry Ketones, you get the same benefits without the jitters or excess stimulation that comes with the adrenalin stimulated enzyme increases. It was also discovered that Raspberry Ketones increase a peptide known as Adiponectin. Adiponectin is a regulator of fat storage within the body. Essentially, higher Adiponectin levels leads to lowered fat storage. Every single capsule of Raspberry Ketones manufactured for Genetic SolutionsTM is made within a GMP certified facility. Good Manufacturing Process Standards are the highest and most stringent guidelines in the nutritional supplement industry. At Genetic SolutionsTM we work relentlessly to provide the consumer with only the highest potency, highest purity, and most cost effective health supplements available to the consumer today. Raspberry Ketones from Genetic SolutionsTM provides 250mg of Pure Raspberry Ketones extract per serving. With 120 capsules per bottle, our Raspberry Ketones product will provide a full 60 days of servings at 2 capsules per day. Our Raspberry Ketones Delivers the highest guaranteed potency and quality extract available to the general public. Made exclusively for those who demand the very best from their nutritional supplements! Full 60-Day Supply, 120 Capsules, Zero Allergens, manufactured in a GMP certified facility. If you have any questions about this product by Genetic Solutions, contact us by completing and submitting the form below. If you are looking for a specif part number, please include it with your message. Raw Green Raspberry Ketones, 100% Pure Advanced Formula & Green Tea Extract for Weight Loss and Appetite Suppression, Resveratrol (90 Capsules), 100% Money Back Guarantee - Order Risk Free! Best Botanicals Red Raspberry Leaf Cut 16 oz.